Now, I have a sweet tooth, and I can’t think of a single fruit I don’t like. However, peaches are way, way at the top of my list, and this Maine girl doesn’t get tree-ripened peaches very often. It is a very happy day when I do get them. 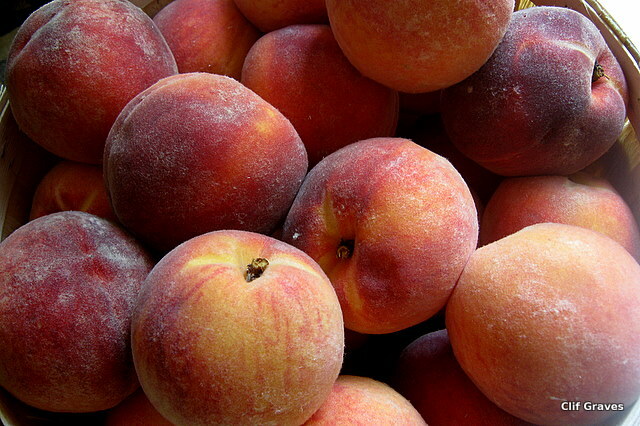 Amazingly enough, in recent years, a few peach orchards have been established in Maine. Climate change combined with varieties developed to withstand the cold have brought peach orchards to this northern state. While there have always been individual trees that have managed to thrive in select micro-climates in Maine, there were never actual orchards. Unfortunately, the local peach orchards are quite a distance from where I live, and I don’t get them very often. How good it is, then, to have friends who have family who are willing to bring peaches to me. Peaches, peaches, peaches. As soon as everyone left, I grabbed a peach and ate it. From the first bite, it was sheer bliss—soft but not too soft, sweet and juicy. I gobbled it down without offering Liam even one bite, and it was only when I was done that I noticed him staring reproachfully at me. He likes peaches nearly as much as I do. Fresh, locally grown peaches are the best! Pure delight! Eliza, so true. The store-bought ones are pale imitations. I went out this morning to our local orchard (been buying from them since I was a kid) and picked up some peaches – you inspired me! Eliza, so glad to be a “peach” inspiration. They are beyond words when they come ripe from the trees. Those peaches are a joy for sure! So glad to be able to share with a true peach lover, Laurie. Judy, the peaches go beyond joy. I think they come under the category of bliss. Again, many thanks!